When I was a young girl, I was feisty, fiery and FULL of life. My nicknames were The Little Cornel and Audacious because, from an early age, I was ready to run the world. I knew what I thought, I felt confident in what I wanted and nobody was going to tell me differently. I was a firecracker. But as I grew older – like we all experience – life happened. Hard and painful things happened. Things that shut down who I was, made me distrust myself and ever so slowly changed my view of God. I woke up at 31 years old, with 3 amazing kids and a husband I adored, but I just couldn’t pretend anymore. I was not ok. Everyday, before my feet hit the floor, I was bombarded with thoughts and feelings that I. was. not. good enough. At anything. A trusted guide helped me to see how I had been making myself small for nearly twenty years – how I had lost my soul voice. I could not recognize the young girl who was fierce and free at heart. Did she even exist anymore? That’s where God met me. He took me on a wild journey from making myself small to being infused with His Holy Spirit confidence. He took me from living in darkness and pain to experiencing His light and freedom. He took me from having no voice to restoring my soul-voice. And He gave me a vision in my heart to help others who feel voiceless too. Bit by bit, God showed me how to be WITH myself again. How to honor my soul within and have compassion for the part of me that was so, so wounded. But by far the most life changing shift that took place on this journey was seeing how God has been WITH me my whole life and seeing how He truly sees me… that He is FOR me and loves me with a tenderness I never knew. I’m wondering if you’ve experienced any of the same? Maybe you’ve made yourself to be small or lost your soul voice. Maybe you’ve felt not good enough. Maybe you’ve realized you don’t really know who you are (anymore). Maybe you know you have unprocessed pain but you don’t know what to do with it or where to start. Maybe you just want to stop apologizing to the world for your existence and take up a little bit of space. This. THIS is where I want to invite you to join my journey. 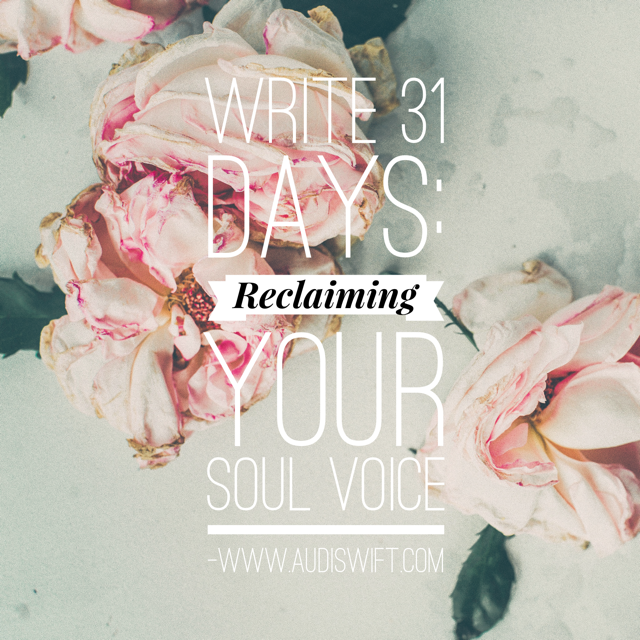 Through the month of October I am joining Write 31 Days and will be writing through some of the highlights (and lowlights) of what it looks like to reclaim our soul voice. I would love nothing more than for you to go with me on this journey of finding our Soul-voice and healing our shame. I believe in the free, whole, unabashed, full version of who you are. How Did We Come to Make Ourselves So Small? Does Our View of God Need to Change? Are We Ready for Hidden Truths?